Good Tuesday all , Have you guys ever had a book that you just couldn't put down . I haven't had one of those books in awhile. 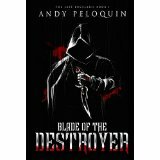 Until it picked up BLADE OF THE DESTROYER (The Last Bucelarii book one ) by Andy Peloquin. Yet he is haunted by lost memories, bonded to a cursed dagger that feeds him power yet denies him peace of mind. Within him rages an unquenchable need for blood and death. When he accepts a contract to avenge the stolen innocence of a girl, the Hunter becomes the prey. The death of a seemingly random target sends him hurtling toward destruction, yet could his path also lead to the truth of his buried past? What can you say about a book that grabs you from the very first page. You become a bit obsessed and read the whole book in like 3 days . I want to introduce you to HUNTER he is the perfect killing machine, ruthless and immortal. But he has a past that is buried deep inside him that is wanting to be released. An event turns the hunter into prey , will he survive the onslaught and exact the revenge. How does an author capture my attention, well by taking a character that seems to be evil and make him into a hero in my eyes, well Andy Peloquin has done it . The book is dark and has a gothic feel to it . As you read you are transported to a time and a city that has thirteen gods and the poor are poor and the upper class are just into themselves. The characters in this book are very complex, you don't know if they are good or evil. The Hunter was my all time favorite character. He is so complex , at the beginning it is all about the killer for hire. You see his thirst for the blood that he kills with his cursed dagger . As you read you see the Hunter change and it feels like he is becoming more human. You see his heart breaking as he finds out what the Bloody hand has done to his friends the beggars. Then when he comes out the other side you see a man reborn and ready to do what needs to be done. The supporting cast of characters are the epitome of good and evil. Farida is the epitome of goodness , she is sweet , kind and has a place in the Hunter's heart. She grabs at your heart strings and gets into your soul. You just want to hug her and keep her safe. On the evil side stands the Bloody hand and the dark heresy. They run the city behind the scenes , they kind of reminded be of the mob. They are running all the illegal stuff going on. They run with an iron fist and there is something more to them then you realize at the beginning .